Who's the Keeper of the Holocron in your company? I was listening to NPR on my way in to work this morning, and heard a truly terrific title – the Keeper of the Holocron – during a piece on the Star Wars books series. It turns out that LucasBooks, the publishing arm of Lucasfilm, has published over 200 novels that extend the story lines of the original movie. These books are written by dozens of different authors, with the story lines controlled by Lucasfilm. 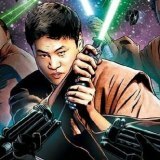 Leland Chee, the above mentioned Keeper of the Holocron, has a database of over 17,000 characters that he maintains in order to ensure the continuity and integrity of the story lines. Wouldn’t it be great if every organization had a Keeper of the Holocron? Somebody who knew all the stories and characters and could swashbuckle his or her way through the functional silos and misperceptions that stymie progress? Well, even if you don’t have such a person, there are tried and true techniques that can help accomplish the same end. Read on for a guest post from reader Steve Jarvis on the power of communication to impact progress. Divisions in a company hold it back. It doesn’t matter if those divisions are between the management of the company and their employees or whether the divisions are entrenched between departments. Now don’t get me wrong I don’t think there is anything wrong with a little competition as long as it’s friendly and doesn’t cross the line. No company will reach its potential if it is divided and to succeed a divided company needs to learn to work and pull together towards one goal. Unfortunately for some companies the divisions are so entrenched through their history it takes a big effort from everyone to change the corporate culture. In some cases it’s a case of there being some members of the company who are invested in keeping the status quo but there is no doubt at all that if your company is divided there has been a breakdown or failure of leadership somewhere along the line. This isn’t a time for finger pointing and recriminations however it is a time to move forward and put in place a culture of unity rather than division. A unified company will gain many benefits from their culture including a happier workforce which in turn leads to increased productivity and reduced staff turnover. This in turn leads to more output for your company and reduced costs. There will always be disagreements in any company just like there are in a family but holding on to these disagreements and resentment won’t help in the long run. So how do you set about changing your company culture? The first thing you need to do is listen and you also need everyone else to listen. Listening is one of the most important skills of any one in any company. The ability to listen allows you and everyone else to hear the other side and to take on-board the best ideas regardless of who suggests them. Listening will also help you find common ground and to help mediate any differences. Throughout the process of culture change you should tend towards over communicating with the rest of the company rather than under communicating as this displays a transparency which helps lower any suspicion of ulterior motives. Encourage everyone during this process to take on board the same way of working. You should also encourage all of your staff to help celebrate any successes and achievements of goals regardless of who the person is or which department they are in if the divisional are along departmental lines. For those companies who are split between management and workers managers should take great care to make sure the right people are given credit for work and achievements. I’m sure most of us have either worked under a manager who seems to take all the credit without doing anything to warrant it or will at least know someone who has. Nothing breeds resentment quicker than someone being rewarded for tasks someone else has done. By being overly clear with communication it will quickly become apparent where any bottlenecks are and these employees should be trained to work the new way or be reassigned. In my experience a manager or team leader who is the cause of contention won’t have much support for long. Document all of the steps openly to the whole company so everyone can see where the end goal is and why the changes are being made. There will always be some employees or managers who are resistant to change which may be because they are just afraid of what the changes might bring. If this is the case then your open and transparent communication will help ease these fears and help all of your staff relish the possibilities of a company without divisions. Explain the power of collaboration between departments and the benefits of staff and managers striving for the same goal. You can incorporate some team building exercises as part of the process but these need to be well thought out rather than just being a jolly. The teams for the exercises should be randomised from your whole staff and not along team or department lines as this will help break down the barriers even further. If you choose to employ an outside facilitator or team building company make sure you are clear about your objectives and if they don’t ask about them then maybe they aren’t the right company for you. Steve Jarvis works for Demon Wheelers who are team building and events company based in the UK. Steve has worked in a wide range of teams and departments across companies of all sizes from under ten to over 10,000 employees. Steve loves writing and passing on his experiences from the last 20 years. Previous Previous post: Summertime Absences – Where did your employees go?